Hearing loss refers to the partial or total inability to hear. Its effects can be temporary or permanent and can develop suddenly or develop gradually over time. Statistically, men are almost twice as likely as women to experience a loss in hearing. Hearing loss may be hereditary, part of the aging process or be triggered by overexposure to excessive noise. Birth complications, bacterial or viral infections, injuries or physical traumas to the ear or head and negative effects of certain medications and toxins all commonly contribute to hearing loss. Hearing aids are a type of device used to improve a person’s ability to hear when hearing loss occurs. 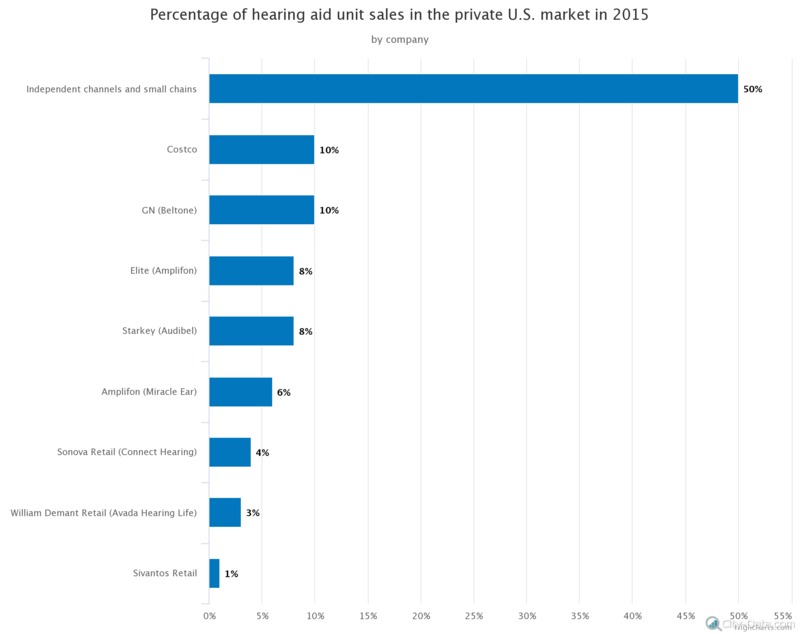 On the graph below, you’ll find the percentage of hearing aids each retailer sold in America’s private hearing aid market in 2015. According to information published at Statista.com, 50 percent of the total unit sales were generated by small chains or independent channels. About 10 percent were generated by Costco. Costco is an American multinational corporation that operates a chain of membership-only warehouse clubs. GN (Beltone) generated the same percentage of unit sales as Costco (10 percent). Beltone is a hearing aid company headquartered in Glenview, Illinois; the company sells its products in the U.S., Canada and more than 40 other countries. Around 8 percent of unit sales in 2015 were generated by Elite (Amplifon). The unit sales generated by Starkey (Audibel) matched this amount, which also generated 8 percent. Amplifon (Miracle Ear) and Sonova Retail (Connect Hearing) generated about 6 percent and 4 percent of unit sales in the private U.S. hearing aid market respectively. Previous PostGlencore: some numbers about the mining industry giantNext PostDeaths from influenza and pneumonia in the U.S.